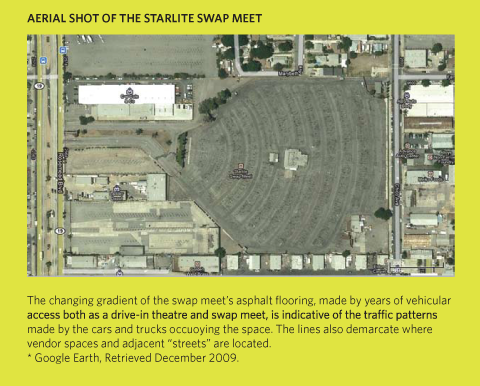 The space occupied by Starlite Swap Meet, an ephemeral gathering place that facilitates sales and bartering in what otherwise would be a vacant lot in the industrial suburb of South El Monte, can best be described as a void in the urban landscape, only becoming a place upon the arrival of the people who occupy it on weekends. Not only does the space become occupied, but it also comes to house what can be considered a true shopping center, whose “retailer” variation and livelihood are perhaps nearly comparable to that of the brick and mortar shopping centers of the Americana in nearby Glendale and The Grove in Los Angeles – of course, in a class of its own. Like the latter entities, though, the swap meet is also privately owned; vendors pay to occupy parts of the space and customers are charged a 75 cent fee each to enter it. Despite only being occupied two days out of the week, the space has managed to sustain a strong following, attracting many to its temporary “streets” and lively “public” sphere. It has continually retained such a large following that any opposition, of which there has been much, particularly from health and safety officials with legitimate and justifiable concerns, has been relatively easily squalled by the space’s ownership and the many vendors and customers linked to its existence. The following account is primarily based on a lifetime of observations– my own family has sold at the swap meet for the last twenty-some years. My family’s bicycle business, purchased from another dedicated bicycle vendor, began as a hobby and eventually became the base of my family’s income as my parents’ work situations changed. The entire family, as well as the day laborers, teens, and occasional uncle we have employed over the years, have worked the stand, engaging in the swap meet’s demands alongside the other approximately 200 vendors. 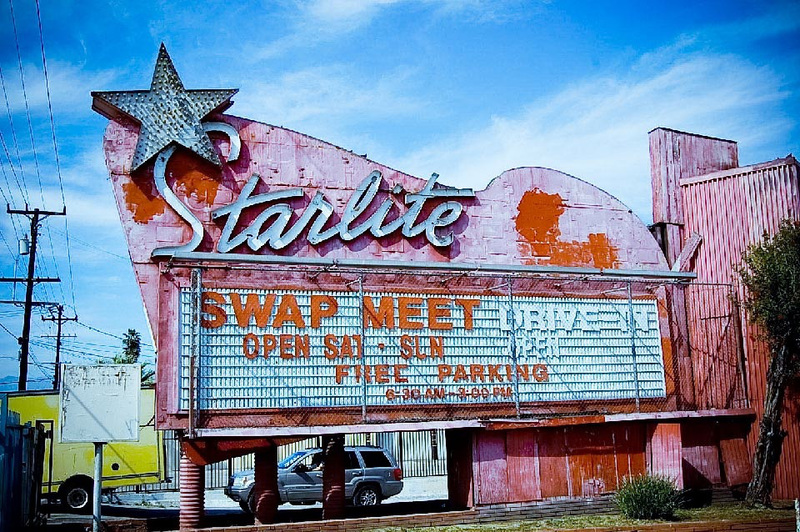 Opened in the 1950s, the Startlite Swap Meet once operated as a drive-in theatre that housed up to 860 vehicles. The otherwise empty theatre lot simultaneously began operating as a daytime outdoor swap meet shortly after its opening. Over time, the swap meet proved to be more successful than the space’s cinematic use; despite the eventual demise of the theatre in the mid-1990s, the swap meet continues to thrive in the shadow of the Art Moderne-like marquee that once marked the theatre’s main entrance, and now welcomes swap meet visitors. Aside from the marquee, its only notable infrastructure is the fence that denotes its boundaries in relation to its light manufacturing and residential neighbors, and two relatively modest buildings located at the center of the swap meet, where a cafeteria, administrative office, and restrooms are located. Sold at the swap meet are toiletries, herbal medicines, pet clothing, and seemingly everything in between. The swap meet’s demographic and cultural components are largely defined by its majority Hispanic, immigrant, and low-income community. However, South El Monte, neighbored by other San Gabriel Valley cities, is also significantly influenced by the many Asian/Asian-American residents that characterize much of the Valley. 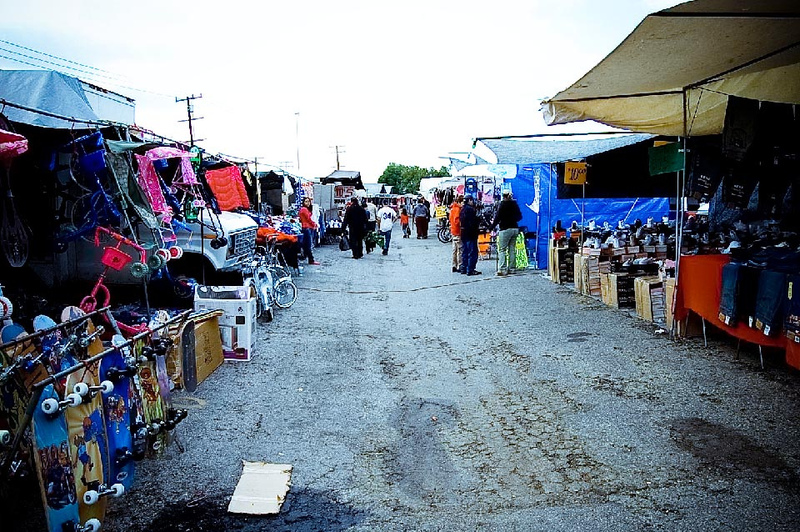 As such, the swap meet’s landscape is altered by the region’s varied cultural influences and can be seen as one walks through the swap meet and learns of the interactions among vendors, and between vendors and customers. It would be negligent, though, to say that the influences are obvious, beside the language barriers that exist between the groups, broken English often being the only language that ties the communities. The entrepreneurial spirit certainly thrives throughout the entire swap meet; however, unlike their Hispanic counterparts, Asian vendors appear to actually prescribe to the idea of remaining inside the spaces for which they have paid. 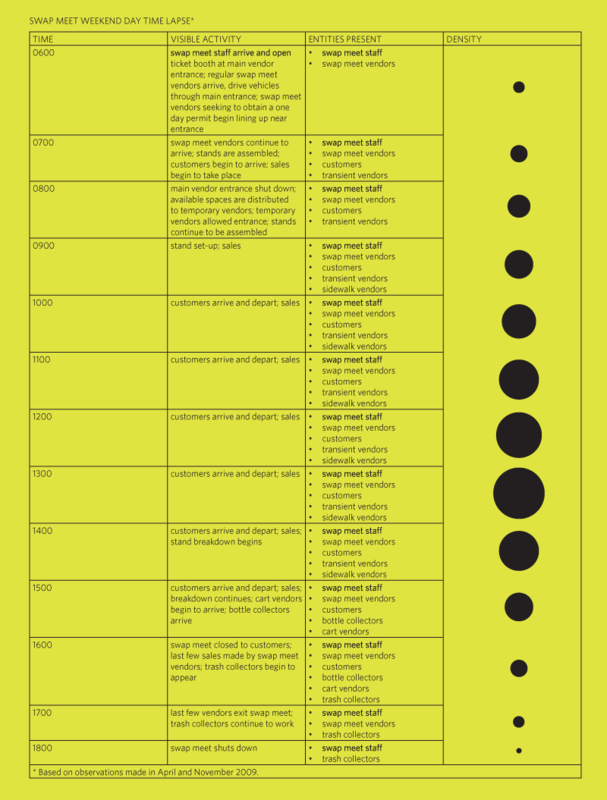 Hispanic participants subscribe to a more anarchistic approach, more fluidly taking on the varied roles defined in the “Primary Swap Meet Entities” diagram. On any given weekend day — rain or shine – vendors begin arriving at the break of dawn, driving their packed vehicles through the swap meet’s west entrance. As urban theorist James Rojas might say, vendors enact, or begin enacting, the environment with their presence, their arrival marking the birth of a new swap meet day. By mid-morning, vehicles are unloaded and stands set-up in time to welcome early customers. Vehicles, particularly those containing the components of a larger stand, are often modified and outfitted with shelves, metal crossbars, and netting to better store merchandise. The stands are themselves props, or “movable items, easily manipulated by the user who provides instant modification” (Rojas). They serve to connect the user to the space in the enacted environment created by the vendors occupying the property’s void. Stands sometimes occupy more than one space, each individual space totaling approximately 400 square feet and costing about $25-50 a day to lease. The structures are, for the most part, modest in size and design, but will occasionally reach heights equivalent to a two-story building and may sinuously weave around the many trucks, equal extensions of these entrepreneurial enterprises, parked in between the stands. Several hours are often spent building the structures, which are typically composed of metal poles, tarps, and the joints and cables that hold them together. Working a stand can be rigorous, and requires a certain kind of physical stamina that can endure seasonal weather changes and heavy lifting. Remaining relatively intact for only a few hours of the swap meet’s 10 – 12 hour long days, the stands usually begin to see their end at about 2 o’clock in the afternoon. The ritual of erecting and dismantling the stand is largely determined by natural time in that the swap meet is solely lit by sunlight, yet sometimes still remains despite evening’s darkness; some vendors are stubborn enough to work according to abstract time in order to make an extra buck. The swap meet, although legal, has often been a source of concern to local officials, who have regularly identified health and safety violations. As a result, property owners have often felt pressured to close the swap meet – or at least pressured enough to alarm vendors of the possibility of closure if they continue to violate regulations. 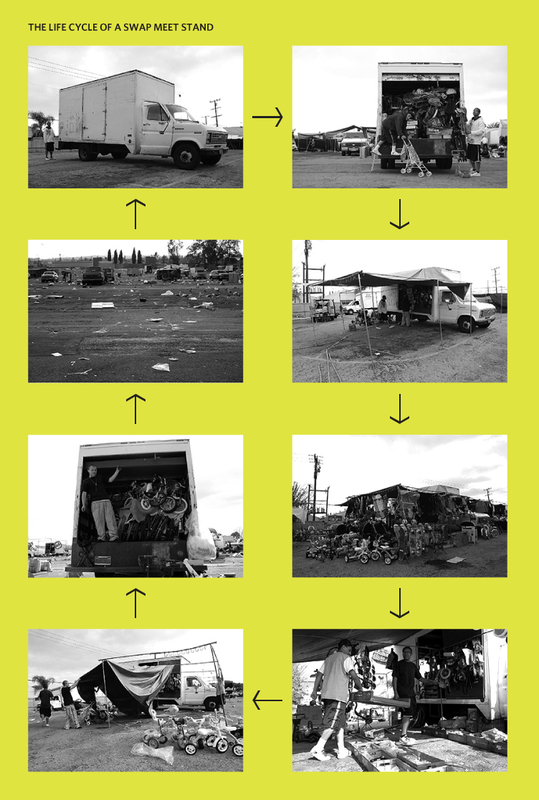 The swap meet manager will periodically – approximately, every six months or so – try to clean up vendors’ violations, which may be anything from placing items outside of a demarcated vending space to selling food out of one’s truck. For the most part, vendors will comply, but will eventually go back to their old habits. The entire sequence—from officials showing up to the eventual vending of uninspected foods—happens so regularly that it almost seems like an inherent part of the swap meet’s workings. Of course, the concerns officials bring to light are often legitimate and ones that can and should, perhaps, be addressed more efficiently. Some architectural and planning solutions, such as simply repainting lines to create more generous egress and ingress passageways for safety vehicles or providing spaces where people can prepare food within health code regulations, could resolve the ongoing and regular concerns. The solid sense of community that exists despite the seeming ephemeral nature of the whole operation is impressive. Despite its thriving weekends, by Sunday evening and straight into the end of the week, after the trash and bottle collectors have stocked their supplies, this loud, eclectic place, where raw capitalism settles the score, becomes a desolate, concrete landscape where runaway plastic bags, caught on fences, rustle in the wind. Always becoming, it follows a constant cycle of rowdy occupation and silent emptiness; once again, it is what it was last week and, come the following weekend, the swap meet will appear and disappear. This consistency within a seemingly transient existence – as marked by the immediateness of the transactions, the exchanges, the relationships, the potential for growth, the ability to mobilize and move ahead into new spaces, relatively easily reshaping one’s business as one goes – is perhaps part of the reason why spaces like the swap meet thrive as they do and have long appealed to folks like my family and the many others who shape them. To be able to go from drive-in theatre, to swap meet, to vibrant community all in one space and in such little time is both exciting and inspiring to witness and live. These observations are sprinkled with bits of theory, evidence of my background in urban design, and are also based on my increasing appreciation for the happenstance innovation that comes into play as a part of the swap meet’s and similar institutions’ inhabitance of potentially lost urban spaces, their vast emptiness seeming to be their greatest asset. Kettles, G. W. (2009). Day Labor Markets and Public Space. Working Paper Series, Mississippi College School of Law. Morales, A. (2009). 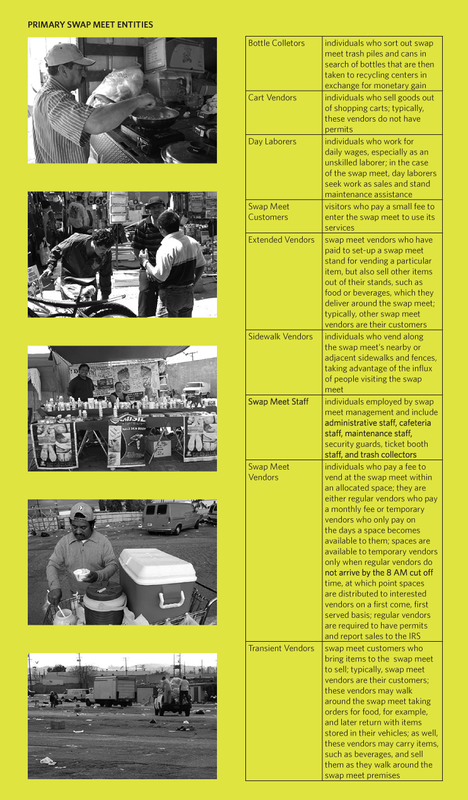 Markets, Merchants and Megacities: Street Vending in Social-Historical Context [PowerPoint slides). Morales, A. (2009). “Public Markets as Community Development Tools.” Journal of Planning Education and Research, 28, 426-236. The San Gabriel Valley is a Southern California region located east of downtown Los Angeles. Included in its 200 square miles are 31 cities and five unincorporated communities, one of which is Monterey Park, the first American suburb to boast an Asian majority. Other notable cities include Pasadena and San Marino, both of which house widely recognized institutions, such as the Norton Simon Museum and the Huntington Gardens. It would be nice to see a new drive in go up in it’s place ,the starlite ,that’s only a thought ,but I would be willing to leave my job at the tehama co. sheriffs office and be the projectionest at the new starlite drive in I could relive my younger years like 1984 thru 1995 yours truly Dave Easter former. projectionest at starlite drive in so.elmonte ca.